The Palace on Kanonicza street was erected in 1505 as a great manor house, which was considered to be the most impressive on that street. It was the foundation of Erazm Ciolek, prominent figure of the early-16th-century Krakow. He was a respected Polish diplomat, writer, and patron of artists. In 1494 he became the secretary to King Alexander I Jagiellon and the bishop of Plock in 1503. Erazm Ciolek was known as a good administrator and protector of peasants. The building is an example of the Italian Renaissance town palace with arcaded courtyard. The main portal is richly embellished. Pillars in the vestibule, however, are the elements of preserved late-Gothic architecture. 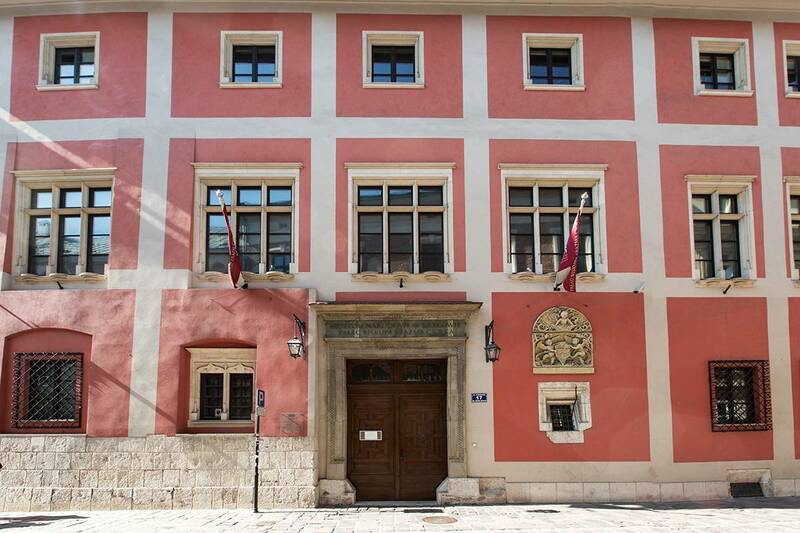 Unfortunately, the original interior was completely destroyed in the 19th century, as the building was used by Austrian authorities as a police station and a prison. Bishop Erazm Ciolek Palace has been a branch of the National Museum in Krakow since 1996. It houses two permanent exhibitions: the first one titled „Art of Old Poland: 12th – 18th Centuries”, the second – „Orthodox Art of the Old Polish Republic”. Both exhibitions are chronologically and thematically followed by the Gallery of the 19th-century Polish art in the Cloth Hall. The exhibition comprises of excellent examples of Polish medieval, Renaissance and Baroque art. Most of the oldest exhibits are of monastic provenance and were donated by various convents operating on Polish lands in the old days. The most valuable part of the collection is dedicated to Gothic and early-Renaissance paintings and sculptures. Madonna of Kruzlowa, is the showpiece of the collection. 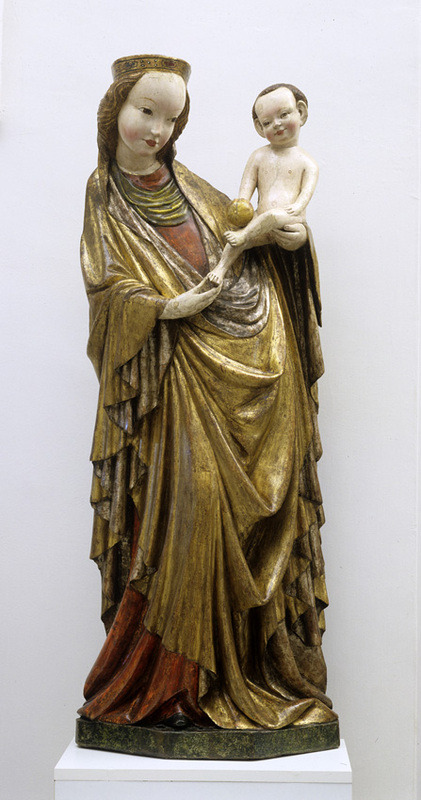 It is a full-figure representation of Mary with the infant Jesus from circa 1410. This elaborately decorated sculpture is made of polychromed and gilded limewood. Madonna of Kruzlowa was found in 1889 by a group of students during a field trip. Among those students was Stanislaw Wyspianski, future artist, and playwright, the most outstanding representant of the Young Poland Movement. One of the exhibition halls is entirely dedicated to Veit Stoss, late-Gothic artist and creator of the exquisite altarpiece in St. Mary’s Basilica in Krakow. The Renaissance is represented by artworks from Northern Europe and Netherlands as well as from Italy. The Baroque art is found in a room dedicated to the old Polish funeral customs. A fascinating testimony of the times is represented by coffin portraits, catafalques, mourning banners and vestments. A substantial collection of old Polish portrait painting closes the exhibition. The exhibition features the little-known artwork of the Orthodox Church, present on historic Polish lands for centuries. The core of the collection comprises icons from the southeast territories of the bygone Polish-Lithuanian CommonwealthRzeczypospolita). The most valuable part of the collection are priceless icons from the 15th and 16th century from the Carpathian region, also referred to as Western Ruthenian. Icons from the 17th and 18th century are also on display. The exhibition is completed with items connected with the liturgy of the Orthodox Church. 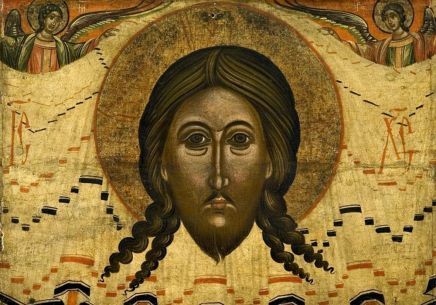 Together, all collections form a comprehensive exhibition of the Orthodox art. The exhibition also includes icons of Balkan provenance and artworks from the territory of present-day Greece.